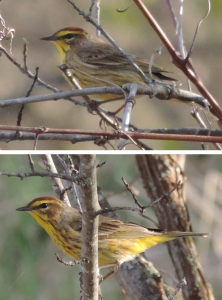 By the third week of April, it is possible that both migrant Western (palmarum) and migrant Yellow (hypochrysea) Palm Warblers may be encountered throughout eastern Ontario. The ‘situation’ here in Ottawa is unique in that we host a breeding population of Yellow (hypochrysea) birds at Mer Bleue and Alfred Bog. I believe these easterners represent this particular subspecies’ westernmost residence in Ontario, but I am not certain, and I’m too busy at the moment to scrounge around for material! 😉 In any case, what this may mean is that eastern Ontario birders, esp. those in the Ottawa area, may at some point come face-to-face with a putative Western/Yellow intergrade that is not safely assignable to either subspecies. In the east, the genetic delineation between subspecies groups is not often the case; more often than not, one particular subspecies grades into the other throughout a geographical area of introgression and it is from this subspecific ‘grey area’ that slightly confusing individuals sprout. 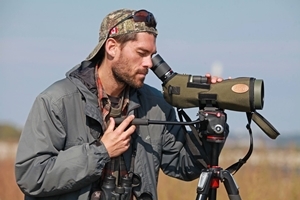 When looking to identify a Palm Warbler to subspecies (often they prod around out in the open, availing requisite prolonged views) keep a few things in mind. Time of day (on a sunny day): a bird foraging in early morning/late afternoon looks more vibrant in tone, especially throughout the head and upperparts, and brighter and more yellowish below thanks to the warm, reddish glow of early morning/late afternoon sunlight. A Western with a light yellowish blush to its belly really ‘lights up’ when the low-plane sun horizontally casts its reddish glow (see Figure 1 below). A Yellow (hypochrysea) Palm is a rare treat in Ontario and requires careful attention to several key ID features. Keep note of the upperparts: they should be rich in tone with a slight greenish cast (this greenish cast can also be seen throughout the head and nape); the streaking to the underparts is also of note: look for broad, slightly coalesced chestnut-toned streaking to the sides of the breast and down the sides of the body (they are brownish and crisp in Western birds); the yellow to the underparts is consistent in depth throughout the entire span of underbody, from the throat through to the undertail (a pale, whitish-yellow undercarriage offsets the yellow of the throat and undertail in Western) ; if given close views or when reviewing photographic material, the eye arcs of Yellow birds are washed with yellow (they are typically whitish in Western). 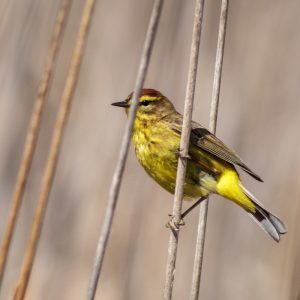 Figure 1: An eastern-like Western Palm Warbler. This bird shape-shifted in and out of designated subspecies camps (well, it appeared to creep close to the Eastern camp when the light hit it ) late in the afternoon at the Richmond Sewage Lagoons on 3 May 2015. Note here how, when shadowed, the light yellow suffusion to the underside is less apparent (top) and quite evident (bottom) when the sun casts its warm glow. 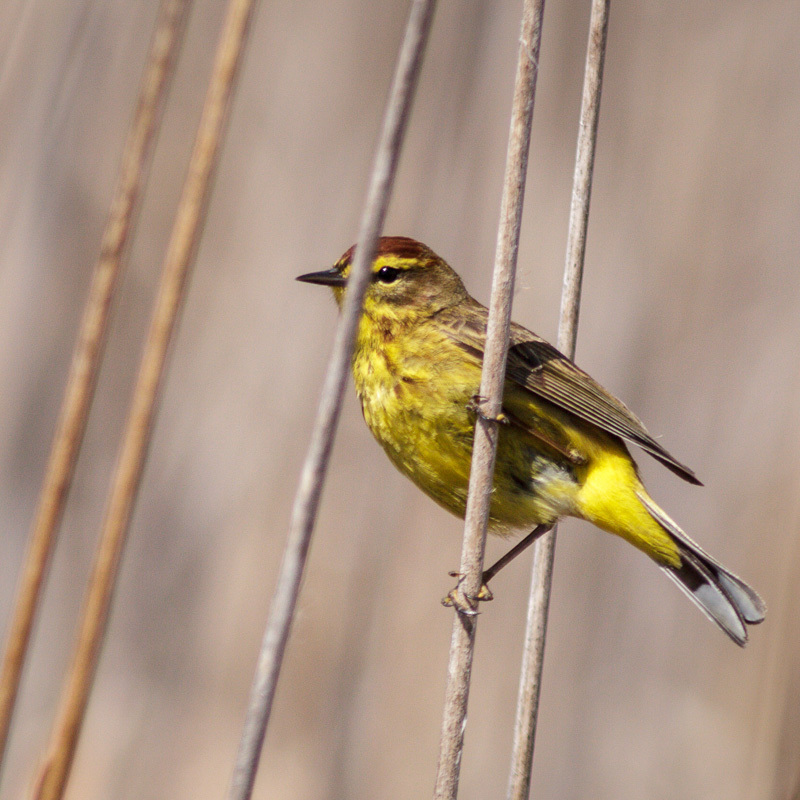 Figure 2: A classic Yellow (hypochrysea) Palm Warbler. Note here the greenish cast to the upperparts; and the thick, indistinct chestnut-toned streaks underlain by a deep-yellow underside. Mer Bleue, Ottawa, Ontario. 25 April 2013. Don Wigle. Thank you to Don Wigle for allowing me to showcase his beautiful photo of an Eastern Palm. Dunn, J. and K. Garrett. 1997. A Field Guide to the Warblers of North America. Houghton Mifflin Co., Boston, MA.